1. Sarah J. Maas - A court of thorns and roses. Because: swoony romance, awesome characters. A retelling of Beauty and the beast. 2. Leigh Bardugo - Six of crows. Because: world-building, plot and cast <3 Six people need to free someone from a highly secured place. 3. Jodi Meadows - The orphan queen. Because: snark. 4. Renee Ahdieh - The wrath and the dawn. Because: plot and characters. Based on Thousand and one night. 5. Becky Wallace - The storyspinner. Because: really enjoyable writing-style. 6. Rae Carson - Walk on earth a stranger. Because: it is Rae Carson. 7. Victoria Schwab - A darker shade of magic. Because: different sorts of London, amazing characters and fantastic villains. 1. Kasie West - The fill-in boyfriend. Because: snark! Character development. 2. Patrick Ness - The rest of us just live here. Because: unique promise. It's all about the people who aren't the heroes. 3. Mindy McGinnis - A madness so discreet. Because: creepy. 4. Cat Winters - The uninvited. Because: touching end. 5. Sarah McGuire - Valiant. Because: use of a not-so-popular fairytale. 6. Naomi Novik - Uprooted. Because: beauty and the beast retelling! Great writing. 1. Sarah J. Maas - Queen of Shadows. Because: Celaena. Magic. Action. Manon. 2. Libba Bray - Lair of dreams. Because: subtle creepiness. 3. Samantha Shannon - The mime order. Because: it's brilliant. 1. Marissa Meyer - Winter. Because: it's all you could ask for. Saying goodbye is hard though. 2. Susan Ee - End of days. Because: gore and bloody. 4. Heidi Schulz - The pirate code. Because: puzzles! Sarcastic voice. Do we have books in common? What were your favorite books from 2015? Perfection and so hard to say goodbye to! Oh wow! Awesome picks! Some I've loved and the rest are likely in my TBR pile or wishlist from the majority I am seeing here! LOL! I approve of this list so hard, it's ridiculous! I really need to read my first Cat Winters book though! You should, she is really good! Such a great list! The Fill in Boyfriend was one of my favorites of this year as well. And I hope to read some V.E. Schwab in 2016 since everyone is alway raving about her characters. I can't wait for you to pick up anything by Schwab! There are a lot of books on your list that are on my TBR list. The only one I've read is "Winter" which is my top fav of the year. I miss the series already! Ha, thank you very much ;) I can understand how hard it must be to be restricted to only 5 books. I couldn't do it, haha. You have some amazing books listed! I'm waiting rather impatiently for the library to get Six of Crows and I have Crown of Midnight waiting on my shelves. 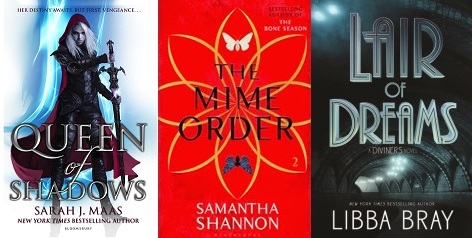 A DARKER SHADE OF MAGIC, THE MIME ORDER, and THE WRATH AND THE DAWN were all on my list this week too! Loved them to bits. And I SO need to read WINTER. I've loved all the books in that series, so reading WINTER will be haaaaard. Sarah showed me that I will read (and love) anything by her. 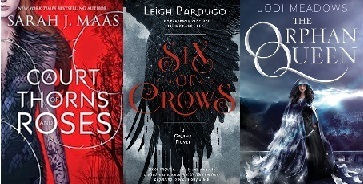 Six of Crows was also a favorite of the year. IT WAS SO GOOD. ZOMG. 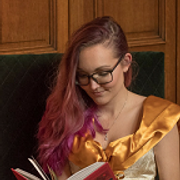 I did read ACoTAR and enjoyed it but it wasn't a favorite .-. I am also so so worried about the sequel. I did start Lair of Dreams earlier this year but never finished it? Like I was actually enjoying it but I never got around to finishing it because I picked up another book instead and I feel like I should really fix that! I think End of days could have been better, but I was still quite pleased how everything wrapped up! Oh man, I need to read like ALL of these books. A Court Of Thorns & Roses has been bumped to the top of my wishlist since reading the Throne of Glass series, and I've heard nothing but amazing things about Six of Crows!! Yes to all of these :D A darker shade of magic is definitely my favorite book by Schwab so far. Now that is a power-packed list. I haven't read many books on it unfortunately (university and reading time rarely mix), but I'm looking forward to reading Winter so, so much! Winter is definitely one of my favourite books of the year too <3 I haven't read all of these yet, but I really want to read The Rest of Us just Live Here!